Four of the bulletins affect all supported versions of Windows, while one bulletin may not involved Vista or Server 2008. Expect a lot of system reboots, as all may require a system restart. 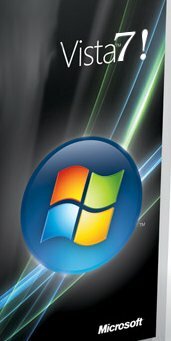 The above refers to “all supported versions of Windows,” but whatever affects Vista is also likely to affect Vista 7, which is simply not released yet. Microsoft is still artificially hyping up Vista 7 by offering gifts to people, who then fake their excitement (even with fake balloons). This sure brings back memories of Poland. As one blogger/analyst reminds us, Vista 7 has nothing at all to be excited about. Windows 7 has no killer features that is so radically different from Vista or even XP. Yes it is very eye candy and supports touch tech, but I don’t think that’s what gets the work done for you. You should not pay for an OS just to get some nice looking icons or a nice looking desktop. No one’s ever been interested in Microsoft’s communism-on-a-disc. Vista7 is no exception. Geeks and managers alike have failed to adjust to the decade old reality that MSFT sales have nothing to do with technology. For geeks, stop treating MSFT as a technology problem and address reality that it is a political / ideological problem. For managers, MSFT is a staffing problem. If one of your staff put Windows in your network, you have a paper trail to the culprit. Use the money from right-sizing to pay for training and clean out any and all MSFT products. Then use the extra money from the increased production to grow. Just be ware that where one form of graft exists, the deployment of MSFT products, there will be other forms of white-collar crime. And where there is crime, those with dirty hands will scuttle around and attack like snakes. Not always, the key thing is to look at how MS was selected. It is not always, but yes it can be graft, considering the techniques MS use to win contracts. Sometimes open source itself is called “communism”. I think neither makes sense. BTW, here is a suggestion for BN. Every Patch Tuesday, how about comparing Linux security vulnerablities with Windows security vulnerablities?